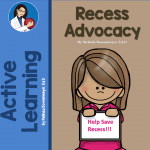 This is a members only page on Recess Advocacy. Parents and educators need a resource to educate themselves as well as local school boards and legislators. This toolbox will give them the resource to gain knowledge about the issues related to the decline of recess in our schools today. In my experience, I have seen that most parents do care about their child’s school day. They are truly concerned about their child’s learning and providing their children with the best education. By providing this Recess Advocacy Toolbox, parents will become educated about the need for recess in our schools especially with the increasing pressure of high stakes testing. This toolbox will also help parents learn how to help maintain quality recess programs in their schools. Steps will be provided to assist individuals or groups in their quest for writing policy recommendations, letters to legislators, and talking points about the need for recess. Health, Nutrition and Physical Fitness Board Policy No. 6700. The board recognizes that childhood obesity has reached epidemic levels in Washington and throughout the country. The understands the importance of recess and its positive effect upon physical, developmental, social, emotional health and well-being of children that in turn paves the way for academic excellence. In addition to required health, nutrition and fitness education, consideration should be given to a 15-minute recess in addition to the lunch recess, at a time determined by the teacher so as to best meet the instructional needs of the children. The timeless institution of recess is in jeopardy. A survey by the American Association for the Child’s Right to Play shows that about 40% of public schools have already cut, or are planning to cut, at least one recess period from the school day. All schools should offer convenient opportunities for students and staff to participate in an enjoyable physical activity, and this imperative should be embodied in policy. Recess in elementary schools is particularly important. Recess, while separate and distinct from physical education, is an essential component of the total educational experience for elementary aged children. At school: Bowing to pressure from parent and civic groups, the nation’s largest beverage companies agreed last May to stop selling regular soft drinks in all public schools by 2010. What does that mean? When parents band together, they have the power to make changes. It can start with the simple step of asking your school’s PTA to lobby for healthier lunches and more physical activity for kids. In fact, the National PTA and Cartoon Network now have a “Rescuing Recess” campaign that has awarded grants to individual PTAs trying to reinstate recess as part of the regular school week. Not only adults but also children need physical activity in order to stay happy, healthy, and focused. If you have children of your own, this won’t come as a surprise. However, one out of every four school-age children is being severely limited in the amount of physical activity allowed during the school day. Recess is another cutback. Schools are rigorously restricting or completely eliminating recess altogether. Recess, while separate and distinct from physical education, is an essential component of the total educational experience for elementary aged children. Recess provides children with discretionary time and opportunities to engage in physical activity that helps to develop healthy bodies and enjoyment of movement. It also allows elementary children to practice life skills such as conflict resolution, cooperation, respect for rules, taking turns, sharing, using language to communicate, and problem-solving in real situations that are real. Furthermore, it may facilitate improved attention and focus on learning in the academic program. In Britain and the USA, a recess (or break time) is slowly being phased out of the school day. For example, a national survey conducted in England in 1995-1996 showed that lunchtime break had been reduced, relative to 1990–1991, in 38% of the elementary schools. Further, afternoon breaks have been eliminated altogether in 27% of the elementary schools surveyed and 12% and 14%, respectively, of preschool and middle schools (see Pellegrini & Blatchford, 2000). Proponents of recess reduction in both countries maintain that recess detracts from an already limited instructional time budget and provides opportunities for students to exhibit anti-social behavior, such as negative peer relations and aggression. However, we maintain that recess plays a positive role in children’s academic achievement and social development and, ultimately, in school adjustment. Our research has shown that breaks, or play, actually encourage academic achievement. Furthermore, youngsters learn valuable social skills by interacting with peers at break time, and these social skills help them to adjust to school. As described above, Jarrett et al. (1998) found that recess benefited all 5 participants with ADD and Ridgway et al. (2003) found that recess benefited all 3 participants with ADHD. This may not be surprising due to the fact that having difficulty focusing on classroom tasks for an extended period of time is a defining characteristic of ADD/ADHD (Jarrett et al., 1998). These studies appear to be the only two studies to specifically evaluate the effects of recess on children with ADD/ADHD. Nevertheless, recommendations abound in the literature for frequent breaks and need for active play for children with a diagnosis of ADHD.